This isn’t my usual kind of book choice from Book of the Month. I don’t usually pick a contemporary book that has heavy hints of romance and some slight magical realism. (If you’ve been around for a while, you all know I’m not a fan of magical realism.) But this book worked for me. I enjoyed reading it, even if I didn’t love it. Tonight is Sabrina’s 30th birthday. She’s going to a birthday dinner with her best friend, Jessica. But, when she arrives, she finds not only Jessica, but an old professor (Conrad), her estranged father (Robert), an old flame (Tobias), and Audrey Hepburn. 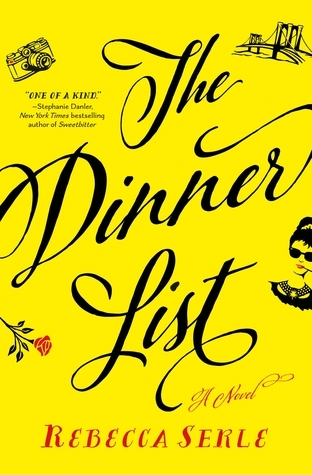 And this book is about her having dinner with all these people, old grievances coming back and the attempt to make a life change in the course of a meal. I did enjoy the characters and how dynamic they were in the end. At first, they all seemed somewhat perfect, but then they grew and you saw the uglier parts of them and the interrelational problems that just happen. They grew and changed, which I enjoyed because this book is the essence of a bottle episode. With flashbacks in time to tell the story, it’s mainly set at a dinner with these five people. That can get a bit boring. And, I will admit to you, it did get boring. I thought that for such a short book — just under 300 pages — it dragged because it was mainly about the characters hashing out the same old problems between characters with the hope that something will change. This book is also heavy on romantic fate. That there is this soulmate out there for you, someone you will love and need in your life. And that there is fate that will draw them to you. While I love fate, I’m not big on romantic fate. Probably because I’m aro, but it’s the way it works for me. I just wasn’t that into it. I know that the review is a bit negative, but I did enjoy it. I thought it was a solid book that had an interesting plot and compelling characters. But, it also dragged and felt very repetitive and was a bit too heavy on romantic fate for me. What do you all think of romantic fate? Do you think that there’s The One out there? ❤ Thank you! I'm hoping for the same thing when we have another buddy read! And hoping you have happy reading as well!